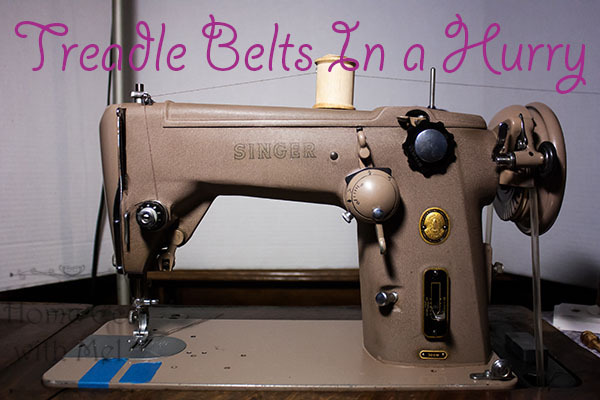 Hello everyone, the topic for this post is going to be treadle belts. I would like to share some of my experiences with various different types of belts and a couple of neat tricks some of you may find useful. Naturally, we will cover the traditional leather belt and some of the various ways to condition the leather to extend the life of the belt. We will also discuss some very none traditional media that I have used to replace belts when there wasn't a leather belt handy. I can't claim all of these to be my own ideas, most were handed down to me by some master treadlers who wanted to share the joy of treadle sewing machines and preserve the art for future generations. With that same passion in mind, I feel obligated and grateful to be able to help pass their ideas and dreams to any and all who may find them useful. My first attempt at using a non-traditional media came from an experience I encountered at work, I am a refrigeration engineer and technician on large commercial chillers. I realized that the seals we were using on the ends of the chillers are basically large O-rings that could be ordered in a variety of thicknesses and lengths. while it is possible to custom order any size it really was not a viable cost effective solution for me. But when an emergency repair at work required seals that were not readily available the solution was to buy a kit that contained a length of rubber of the correct diameter,razor blade,to cut the length needed,rubber cleaner/primer and glue, Suddenly it became much more cost effective.When I researched the primer and the glue I realized it was basically PVC pipe cleaner and Super Glue. I thread the rubber thru same as fitting a new leather belt. Cleanly cut the length needed clean both ends os the belt to be glued with the PVC cleaner. Allow it to fully dry,apply glue to the fresh cut ends and align and press together the two ends until fully bonded. Suddenly I was able to make any size belt needed. I have even used this technique to make belts for some of our stubborn electric machines around the Quilting Room. Another quickie belting technique that I have found useful is air line, sometimes referred to as aquarium tubing or oxygen tubing it can be easily sourced at most hardware stores. I usually have some oxygen tubing either left over from some time spent in the emergency medical service or some that I have picked up at auctions or yard sales. 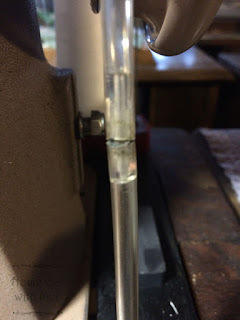 The best way I have found to use this type tubing is to cut the end off, thread it through the machine and cut to length just as if you were putting on a new leather belt. I always cut mine about 1/2 inch short so that when it stretches it will still be functional. I then cut a 1-inch piece from the leftover tubing and split it down one side so it can be made to unroll and lay flat. While holding it flat on a cutting mat or wood block I trim 1/16 inch off of the side of the tube so when I let it re-curl it will still be a 1 inch long piece and it will roll into a tight cylinder slightly larger than the inner diameter of the tubing, I like to warm the opening of the tubing by dipping it into very hot water so it can be stretched a little by forcing a screwdriver into the open end. It only needs to stretch deep enough and wide enough to accept the 1-inch cylinder. I push the cylinder into the tubing half way. Then with the tubing threaded through the machine but not over the drive wheel I do the same thing with the other open end over the second half of the cylinder, As it cools it will shrink back to size and the cylinder becomes a very efficient coupler to hold the ends of the tubing together. It makes for a very quiet running treadle belt. My favorite alternative media for a treadle belt was passed on to my wife by a woman from the local nearby Amish community. She suggested using stockings,(nylons) when we needed a belt in a hurry. Her method was to cut the toe out of the stocking and wrap it around through the belt path and tie it off then stretch it over the drive pulley and the hand wheel. I didn't like the idea of the knot so I streamlined the ladies idea into a working solution that I love. here is what I do now on any machine I am going to use a lot or possibly trade heads out of from time to time. I use long thigh high stockings or pantyhose legs. I cut the thigh band off and the toe seam I thread the treadle base same as I would with a leather belt.I overlap my two ends about 3/4 of an inch and roll them together, with the nylon off of the hand wheel and the drive wheel I then hand sew or set an electric machine on the edge of the treadle table and ZZ stitch the two ends together. The overlapped seam will still follow through the belt path when stretched over the drive pulley and the hand wheel. 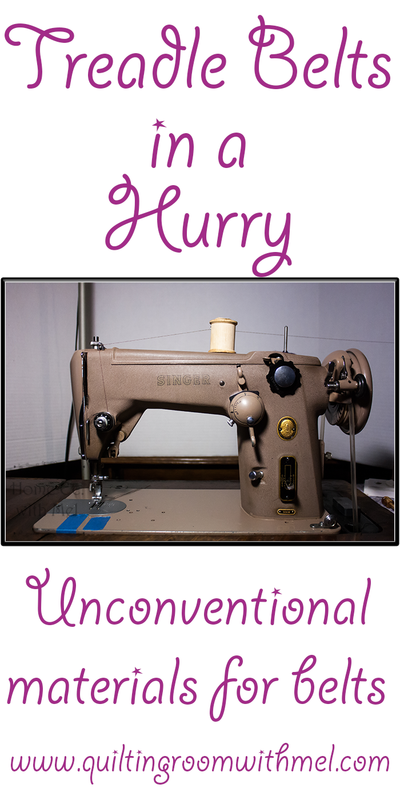 Super quiet, very efficient and can be stretched to allow different heads to use the same treadle base. I love the results and get to choose different colors too. Mel did a short video showing off the belt. I hope these ideas will help some of you to enjoy your treadles to the utmost of their ability. If you don't find they fit within your realm of usefulness I hope I at least made you laugh at my endeavors. Enjoy your machines, Happy sewing to you until next time. Interesting, now if I could only find the machine for my grandmother's treadle cabinet. Thank you Mel and your husband for making these videos. I have a bid out for a 306w. If I win I am going to put it on a treadle cabnet. do you have a video to show how you do the aquarium tubing? also, roughly how long does the aquarium tubing last? We don’t have a video but will put it on our list. As far as how long it lasts we can’t really answer. We’ve had one setup with it for a couple of years now. We haven’t had to replace it.